Which bacteria live on our skin? A medical and scientific revolution has been underway since microbiology discovered that our health depends on a multitude of microorganisms living in different parts of our body: intestine, mouth, lungs, and even on the skin. These bacteria and other microorganisms naturally present in humans participate in numerous biological functions. We live in genuine symbiosis with them. Due to the complex way in which they function, today they are known as “microbiota” instead of intestinal or cutaneous flora. The word “microbiome” refers to all of the genomes present in a microbiota. As it has already been the focus of extensive research, intestinal microbiota is the best known to date. We know that the bacteria that compose it participate in digestion, regulate immune system development, and even brain development in children. They can control inflammation and hunger; they supply components that migrate to the brain and can affect our behavior and mood. Today, researchers make a correlation between modified microbiota and obesity, diabetes, allergies, even anxiety, depression and autism. The various microbiota hosted by our bodies evolves during our lives. They are subject to imbalance and alterations and are an individual’s signature, just like a person’s underlying diseases. Their balance is essential to our health. With an average area of 1.8 square meters, the skin is the largest of our organs. More than just a physical envelop, it forms an immune and microbial barrier. One of its essential functions is to protect us from pathogenic bacteria by keeping it from penetrating our bodies. The some 10 billion bacteria living on the surface of our bodies, along with other micro-organisms, form the skin microbiota. The skin does not recognize commensal bacteria, in other words, bacteria naturally present in healthy subjects, as foreign: they do not trigger an immune response leading to their destruction. Not only does this bacteria fall under the “radar” of our defense cells, but their mere presence stimulates and reinforces the immune response to pathogenic bacteria. Just like intestinal microbiota is involved in numerous diseases, skin microbiota is associated with inflammatory imbalances in the skin. Chronic infections like psoriasis, atopic dermatitis, acne, and seborrheic dermatitis are frequently associated with a disturbance in this fragile cutaneous ecosystem. The different species of bacteria that compose the skin microbiota are not evenly spread over our body surface. Each species has its own habitat, chosen on the basis of humidity, salinity, temperature, acidity (or pH), perspiration and sebum content. Within a same habitat, simple microorganisms (bacteria and viruses) coexist with other more complex bacteria (fungi and mites). About eighty species of fungi live on our skin. They are usually inoffensive unless for some reason one or the other begins to proliferate. For instance, Malassezia yeast can trigger seborrheic dermatitis (dandruff). Minuscule arthropods that live off of dead skin and can be found at the root of facial hair, among others, can cause various complications (rosacea, conjunctivitis, etc.) if their balance is altered. Staphylococcus epidermidis is one of the most abundant bacteria in the skin microbiota; it actively contributes to the skin’s balance and protection. Not only does this mutualist bacteria not damage the skin, it naturally produces anti-microbial peptides (lantibiotics) that are toxic for other microorganisms like Staphylococcus aureus. By enhancing the growth of this mutualist bacterium, the skin microbiota enables it to provide additional protection from pathogenic bacteria. 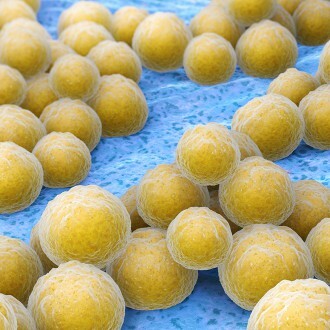 Staphylococcus epidermidis could also promote the integrity of skin defenses by activating immune defenses. Skin microbiota forms in symbiosis with skin cells. Its diversity and balance are determinant factors in our skin’s health and beauty. That is why it is essential to take care of it and remedy everyday alterations caused by age, pollution or harsh toiletries.